Changing the Site or Home URL settings does not move the site. The addresses must be the correct address to reach your site or content. If either of these are set incorrectly you may break your site. Click the "Settings" link on the left side. The Site URL is the address that visitors type into their browser to view your site. You may want to update this if you have recently moved your site. 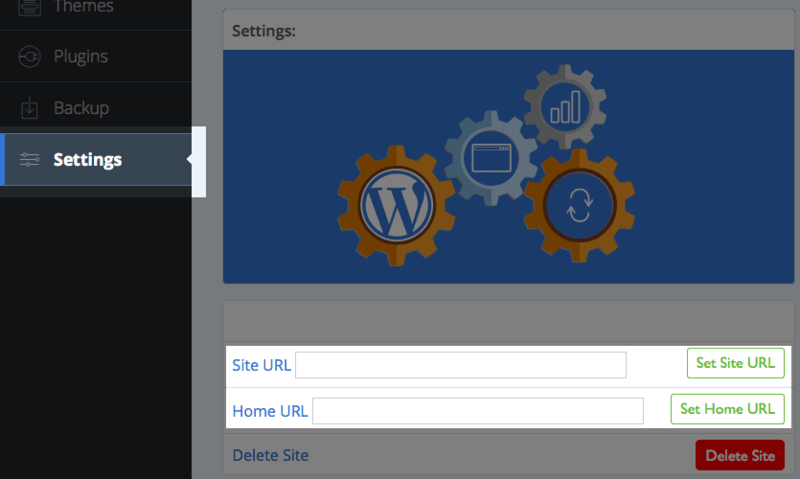 Using the "Select WordPress" dropdown, choose the WordPress site that you want update the URL's on. In the "Site URL" box, enter the new site URL. Click the "Set Site URL" button to save the change. The site URL is now set in the WordPress database. You can review your site and make sure the site works correctly. The Home URL is the address for the core files of your WordPress sites. In the "Home URL" box, enter the new site URL. Click the "Set Home URL" button to save the change.